Over the last few months, I've been shooting a piece for Philip Dolin of Particle Productions for former Manhattan Borough President and humanitarian, Ruth Messinger's 70th birthday. 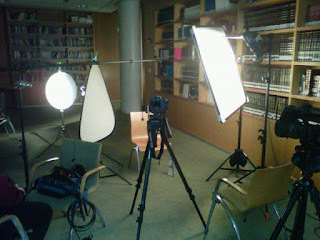 The video was commissioned by the organization she currently runs, AJWS (American Jewish World Service). Though there is some nice archival material throughout, the piece rests solidly on interviews with an impressive roster of names including Mia Farrow, Elie Wiesel, former NYC Mayor David Dinkins, and NY Times columnist Nicholas Kristof. For the lighting geeks... for most of these interviews, we were very limited in terms of time and space, so our setups and gear needed to be versatile but compact and quick. My lighting package for this whole piece consisted of my trusty 4bank fluorescent, 2 Lowel Pro Lights (250w), a 5-in-1 reflector, my faithful unbleached muslin reflector, and a small soft gold/white flexfill. Philip and I decided that the look was to be naturalistic but not boring. Whether motivated or not, every key was an inside key. If there was a window in the right spot, I could force in an edge. Without motivation, I would try to sneak one past if I needed the separation. This package was the perfect compromise of versatility and compactness. On the camera end, the 550D was almost always fitted with my 28-50mm Contax/Yashica Zoom. In general, I (and many others) find it to be good practice to have zooms on hand in most doc situations (though on a recent Gevalia shoot, I shot for a solid hour on just a 50mm prime). Especially when time is so tight, being able to nudge a few mm tighter or wider is so valuable. In the Joy Levitt interview, however, I decided to go with my 24mm Pentax, because I wanted a wider field of view than the C/Y could give me. One of the more difficult things about this shoot was crippling the DSLR to match the EX as best as possible. The standard picture styles and some of my favorite non-standard ones are incredibly beautiful in how they handle contrast and skin tones. However, the A-cam EX1 has a much flatter image. I didn't have the prep time to go in and match everything as well as I'd have liked. It would have required days of testing as the settings are vastly different. The EX has gamma and knee adjustments as well as a dozen other things that make a difference, while in-camera, the DSLR has contrast, saturation, sharpness and a couple of others. On most of these shoots, I opted for a more flat setup on the 550D to match the lower contrast EX but it's funny - even held back like that, I much prefer how the DSLR shots look. With a reasonable amount of time, Particle Productions could have matched the two perfectly but to be honest, I'm glad the finish was so quick - it's really nice to see the two cams side-by-side in the same lighting environments. Here are some of my setups. In some situations, I used everything I brought and in some I didn't. Mia Farrow's interview, for instance, was shot using just the flexfills. The only time I used a diff frame. Joy Levitt's interview. 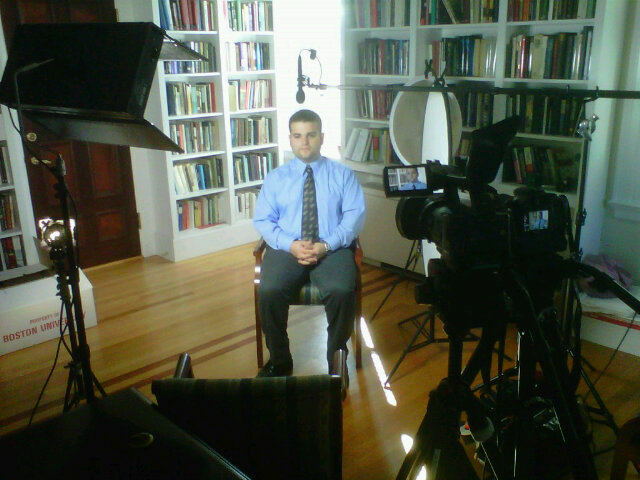 Sound guy Bret sitting in for Elie Wiesel. 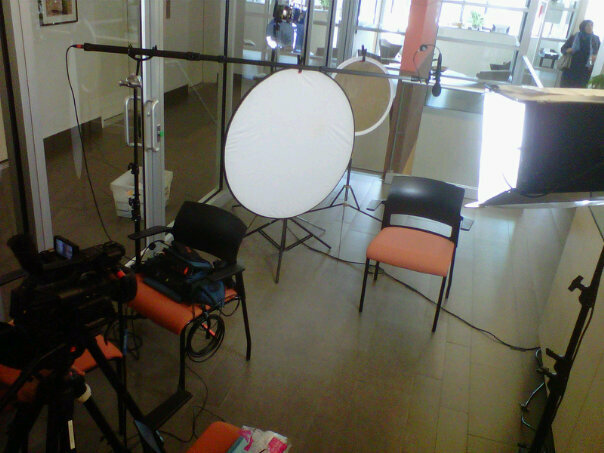 Setup for Dr. Sakeena Yacoobi. UnemployedWorkers.org has launched and features the material I blogged about last. I shot the interview with Christine Owens (bright office) and Roger Grange & I shared the duties of shooting all of the interviews against black. 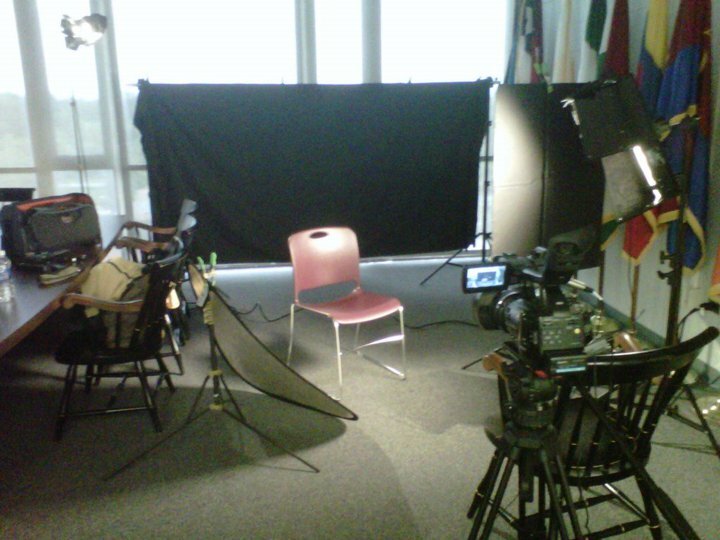 Those particular interviews were shot on greenscreen (see "A Greenscreen in Harlem") - the decision to go black background was done late in the game. Otherwise, we'd have shot it on black for real. And... segue... Here's another video I worked on recently that features interviews against black. Producer/director Larry Locke shot the b-roll, while I lensed and lit the interviews (against actual black). There are a lot of digital effects over the video, diffusion, color stuff FX, etc., but the solid work is there. I'm happy with how the interviews came out. Simple duvetyne backdrop (velvety side towards camera), 4bank flo for key, Lowel Pro Light for edge, and an unbleached muslin reflector for fill. A lot of blackwrap and black foam core for control (which, along with a good amount of distance between subject and BG, is essential for good interviews against black). Soon to come - a big post on interview lighting (and shooting). Stay tuned!